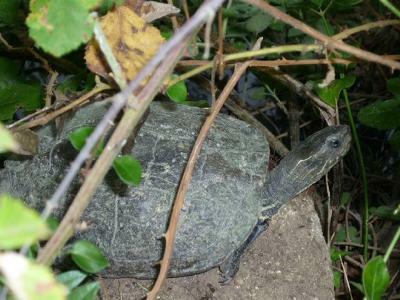 We are presently on the Agni Travel Site Greece and a question has raged for some months on what is the turtle or terrapin colony in a deep watercourse/ditch running beside our house in Corfu. I have many pictures and there is one on the Agni site of a creature of about 12" x 10" or more which looks powder/grey/blue as it lies in the sun to an asbestos blue when it enters the water. It has some stripes on the neck but cannot be compared with the local terrapins which are also in the watercourse as well. Many people are trying to find out if this is a lost species and many ideas have been put forward without success. Can you help? That's a handy tool for all sorts of things. If you have more than one photo you want to submit, you can sent them as an attachment to the email you get when you are alerted to posts here. Then I can add them to your post manually if you think they would be helpful.